With a flaming explosion of colour, movement and sound the Flamenco Festival begins with a thrilling show by Sara Baras. Her troupe lights up the Sadler’s Wells Theatre with a passion that hasn’t been seen since Riverdance. La Pepa is the brainchild of Cádiz native, Sara Baras. For over 20 years she has studied and performed Spain’s fiery dance tradition across the globe. Her performances tell stories and this one begins with the sounds of a battle. Immediately the audience are transported to 19th century Spain when the country was fighting against Napoleonic France. Shouts, screams and explosions assault the ears while the theatre remains in complete darkness. Gradually, lights illuminate a stage where men and women are garbed in black converge. Only a simple brick arch gives a semblance of place. The first cord is struck and the dancers demand attention. A drama unfolds of loss, horror and pain. It is war. The choreography is very modern for such a traditional dance form, setting the tone that this is no ordinary exhibition of flamenco. Grace and power meet with passionate results as history moves ahead to the climax – the signing of Spain’s first constitution. Each of the dancers is consummate in their skill and together they are like wildfire. However, no one commands the stage quite like Ms Baras herself. From her first memorable solo in red to the finale, she completely mesmerises the room. Her technique is impeccable with every barrel roll on point, every click of her shoes sharp, and each articulation of her hands precise. However, it is her face filled with so much emotion that even those in the furthest seats are struck by her presence – a true master of the stage. Skilled musicians accompany the dancers and their precision is no less awe-inspiring. Spanish guitarists, box drummers, and cantors (traditional flamenco singers) fill the entire theatre with their music. You don’t need to speak a word of Spanish to understand the pure emotion in the songs. The musical highlight of the show is the duet between the two box drummers. With huge grins on their faces, they drum so fast and so accurately that it is mind-blowing. 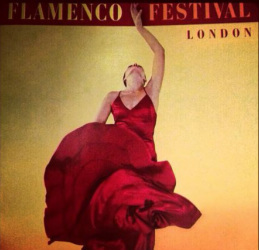 This combination of the passionate, skilful dancers and musicians is the definition of flamenco.